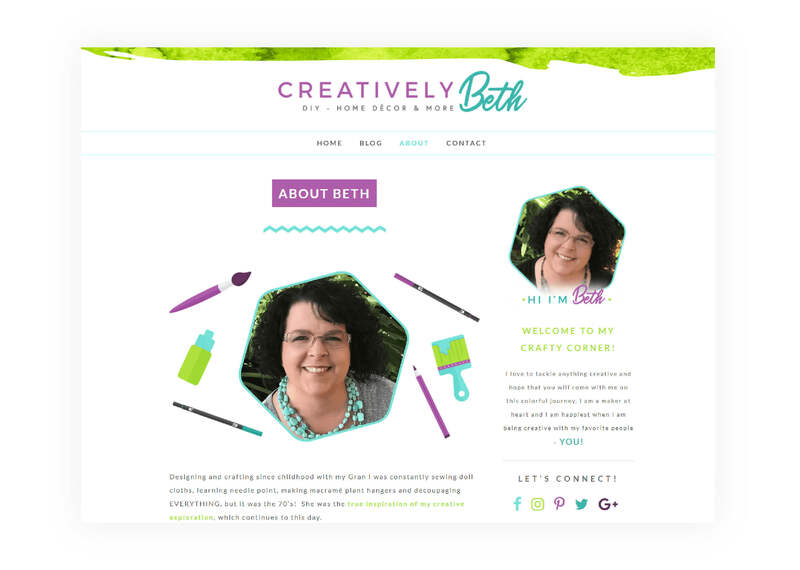 Earlier this year, I got an inquiry from Beth Watson, who was looking to rebrand her blog & business from Beth Watson Design Studio to Creatively Beth. She had a blog on Blogger and she decided to change the business name and website platform. I couldn’t be more excited to work with another crafter (after Kingston Crafts and Scrap Me Quick Designs). 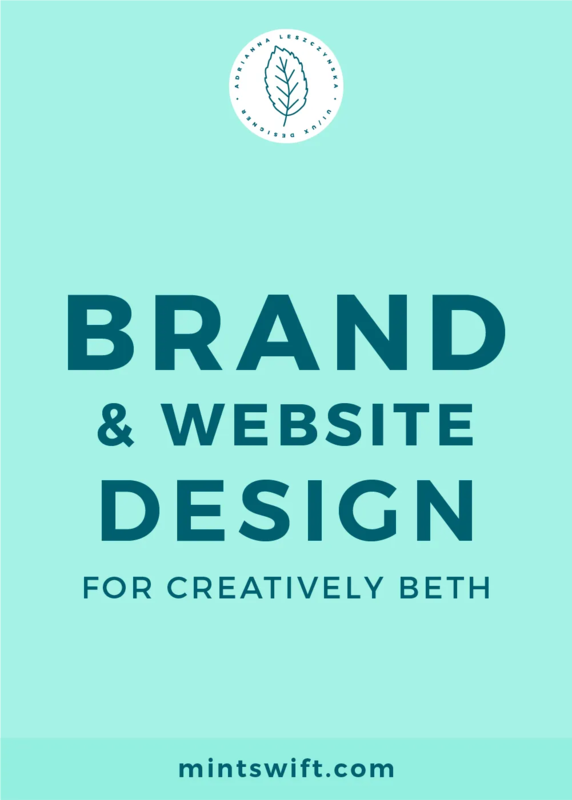 Today, I’m thrilled to share with you the brand & website design for Creatively Beth. Below, you’ll find out more about Beth’s brand, her brand keywords, what package did she choose, what was included in the package and what was the individualised solution for Creatively Beth. 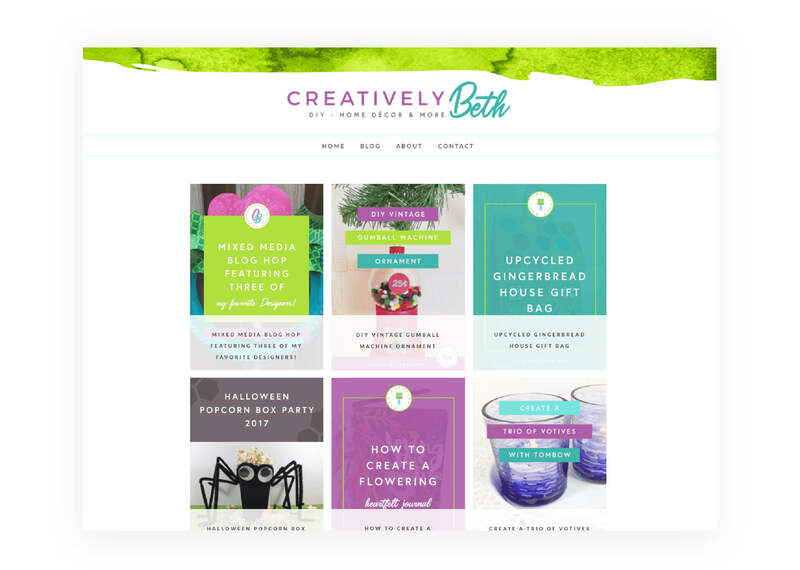 Creatively Beth is a brand that will provide people with an inspirational outlet to create original craft projects, DIY, home decor projects, kids craft projects and fun baked goods recipes. With an emphasis on reusing and upcycling traditional materials and using them in unconventional ways. Beth works with manufacturers such as Tombow USA, Kunin Group Felt, DecoArt, Clearsnap and Walnut Hollow. 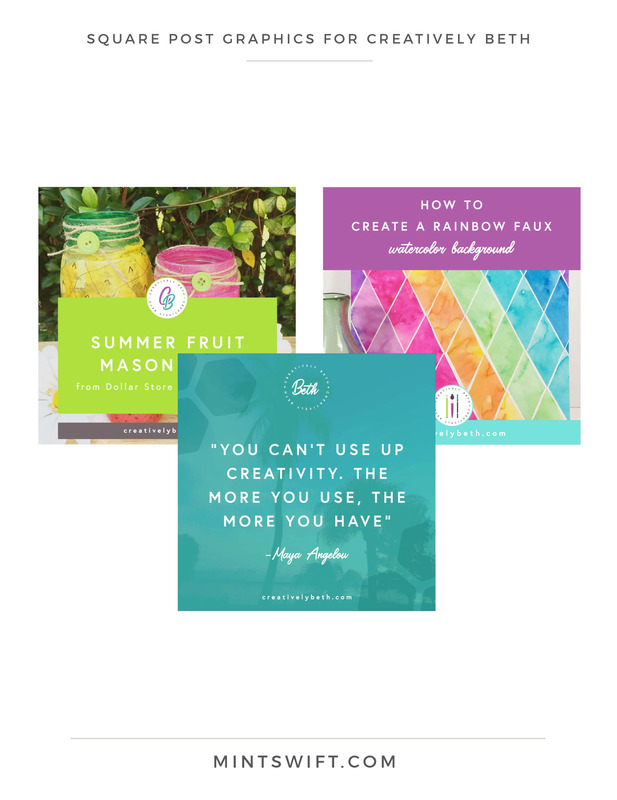 Beth’s target audience is crafty ladies (and men) who want to learn how to create original pieces of crafty artwork for their family, friends and homes that will become cherished keepsakes. 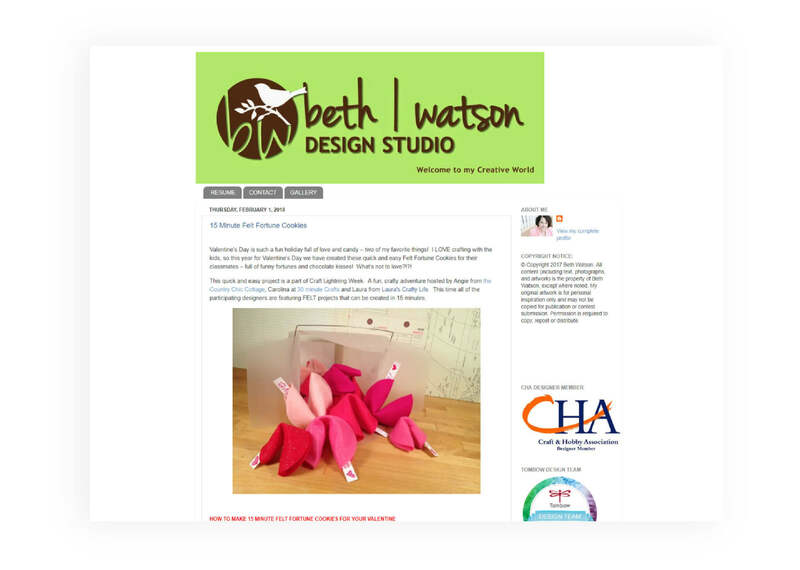 As I mentioned above, I helped Beth with her rebranding from Beth Watson Design Studio to Creatively Beth. Beth wanted a bright and creative website to showcase the companies she collaborates with, in her designs. We changed everything from the name to the website platform. The new brand & website design for Beth are reflecting her personality, showing her love for crafts. 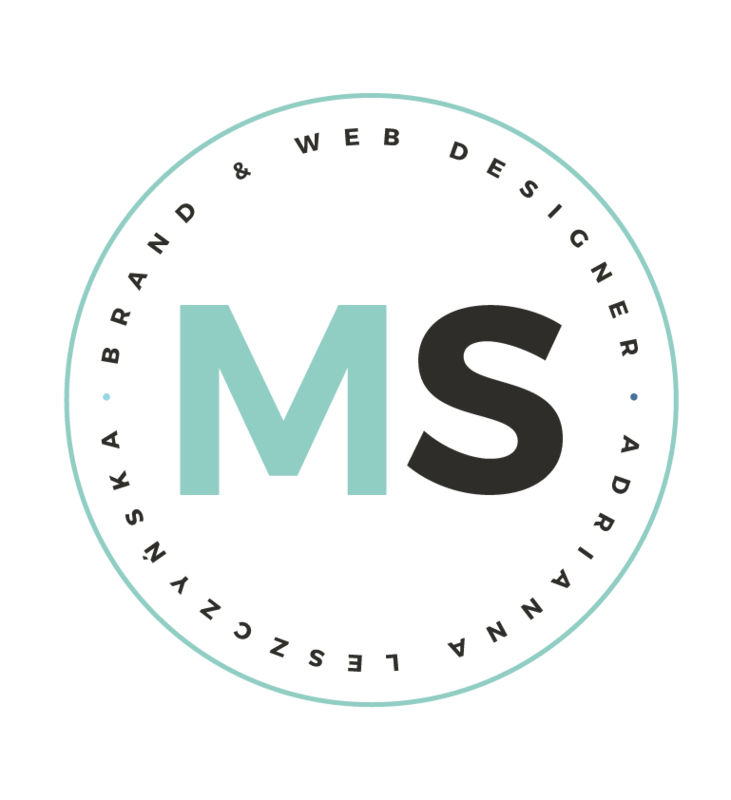 Her website looks professional and trustworthy which encourages the manufacturer for more collaborations. One of the reasons for Beth to change her business name from BW Design Studio to Creatively Beth was to make her brand appear less formal and to highlight the versatility of the craft projects she’s creating. Therefore, the main logo design for Creatively Beth features sans-serif font with a script font (my favourite combo!). 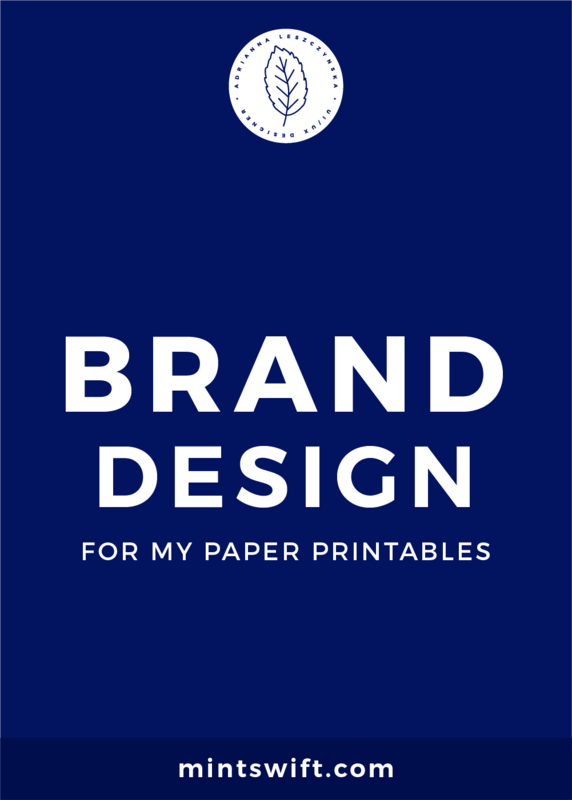 I decided to use three colours in the primary logo – purple for the word Creatively, teal for Beth (for the first name to stand out, since it’s a personal brand) and dark grey for tagline DIY – Home Décor & More. 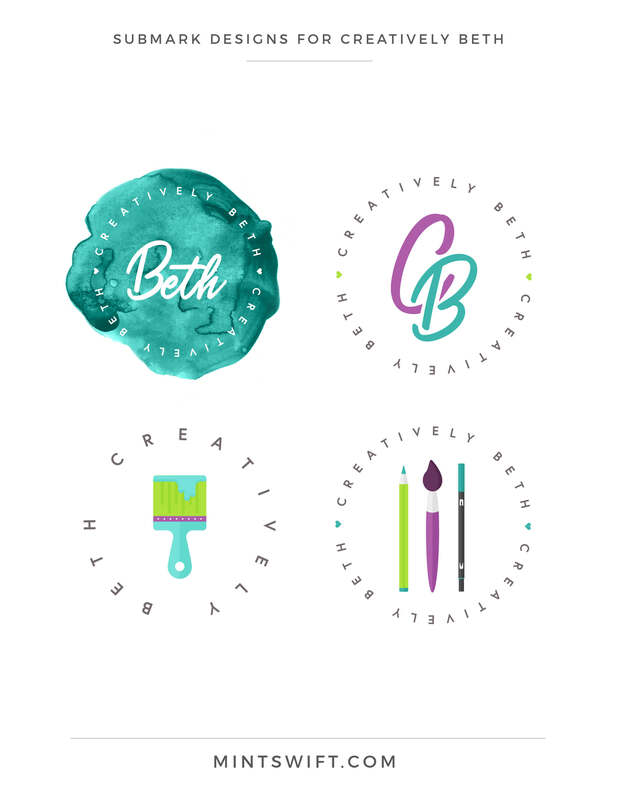 I designed three alternative logos for Creatively Beth – the first one features a watercolour swoosh (more about it in point 5) and the main logo in white colour. For the second alternative logo, I used the sans-serif font that you can see in the tagline. And the third alternate logo is a different colour variation of the primary one, but using the brighter part of a colour palette (point 4), so grass green and vibrant blue. I used another watercolour texture and shape in the first submark design for Beth. I also emphasised her first name (since she’s the “face” of her brand) and put in in the centre of the submark. The second submark (my personal favourite), includes Creatively Beth initials with a use of negative space between the letters. The second submark (as well as the fourth one) includes a little hearts, that represents Beth’s love for crafts. The third submark (which I used for the website favicon) features a brush and the fourth one (used in the footer of Beth’s website) includes a pencil, brush and Tombow marker. The colour palette for Beth Watson was inspired by her projects from Instagram. I choose colours from light green, blue and purple range. The colour palette is bright, cheerful and showcases the versatility of the projects she’s creating. 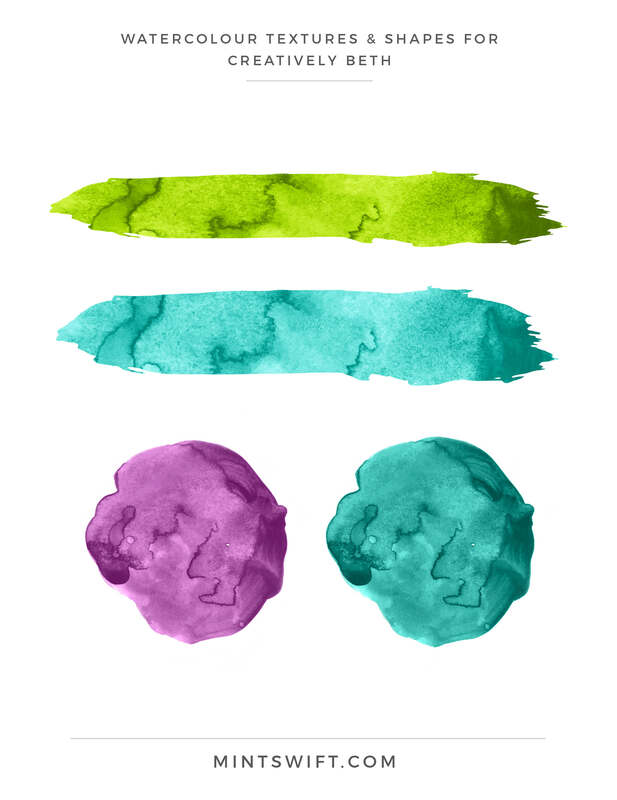 As I mentioned in point 2 and 3, I designed several watercolour textures and shapes for Creatively Beth. Why watercolour? Because it’s what Beth uses a lot in her projects and because she’s collaborating with companies like Tombow USA. I created several design elements for Beth including: a “hello signature” used on the homepage of her website, a clever blog signature Creatively, Beth, chevron text dividers, custom pin it button, favicon (similar to the third submark logo) and image holder with Hi, I’m Beth, which you can see on her blog’s sidebar. 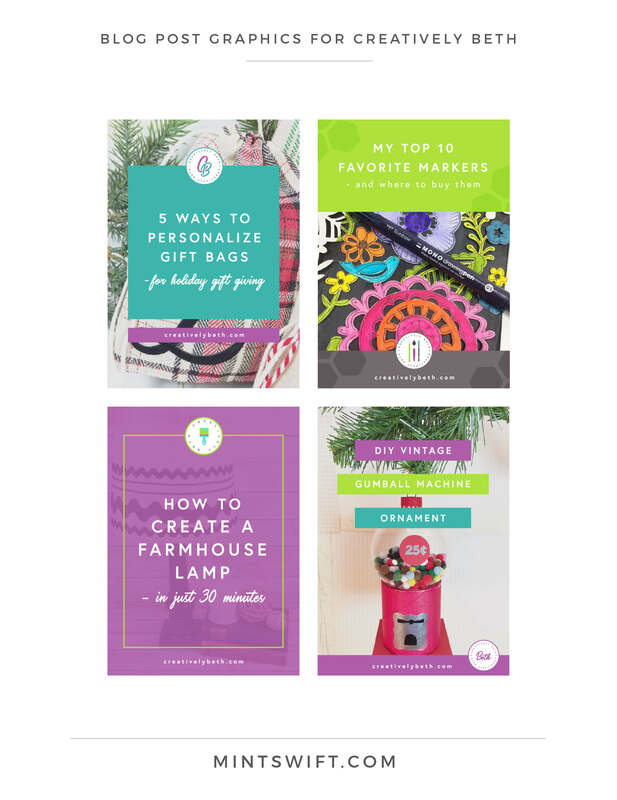 I designed six blog categories icons representing: home décor, kids crafts, upcycle, recipes, DIY and holidays. All of the icons features a hexagon as a background, which (same as watercolour textures), plays a big part in Creatively Beth brand & website design. I usually create three blog post graphics styles for my clients, but I felt especially inspired, so I designed four styles for Beth. The first blog post graphic style includes a photo background, colour boxes with the blog post title, website URL and the second submark at the top. The second blog graphic also includes colour boxes, with a subtle hexagon pattern, along with the fourth submark logo. The third blog post graphic includes a photo with a colour overlay and third submark. The last blog graphic includes colourful rectangles (I incorporated this style on Beth’s website) with the blog post title and first submark. As always, square post graphics correspond to the blog post graphics to make sure the Creatively Beth brand is cohesive not only on Beth’s blog but also on social media. The first square post graphic is very similar to the first blog post graphic, including colour boxes and second submark along with the blog title and website URL. The second square post graphic is a simpler version of the second blog graphic style that also includes colour boxes and fourth submark logo, but it’s without hexagon pattern. The third square graphic is used for quote-type-posts and it includes a photo background, colour overlay with subtle hexagon pattern, along with one of the submarks. 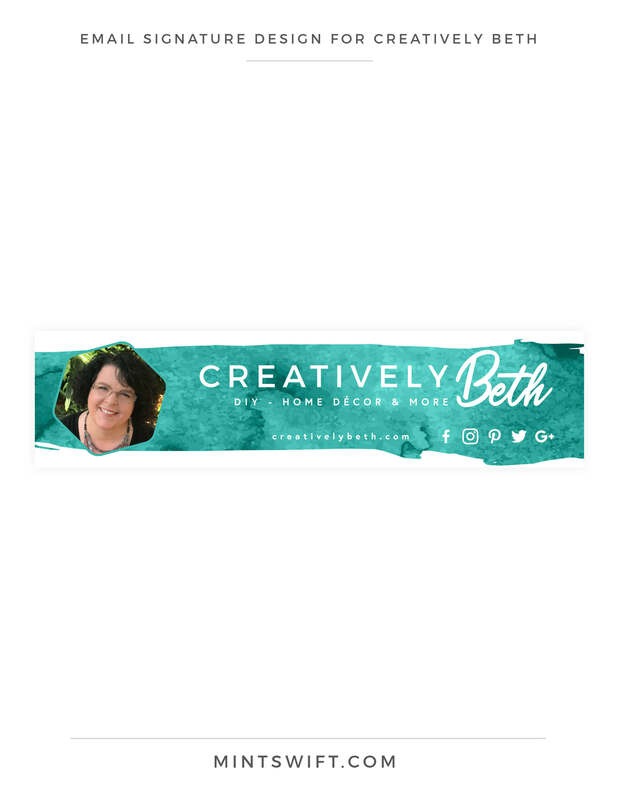 The email signature design for Creatively Beth includes the teal watercolour swoosh as a background, Beth’s profile picture (used in blog sidebar), logo in white, website URL and social media icons. 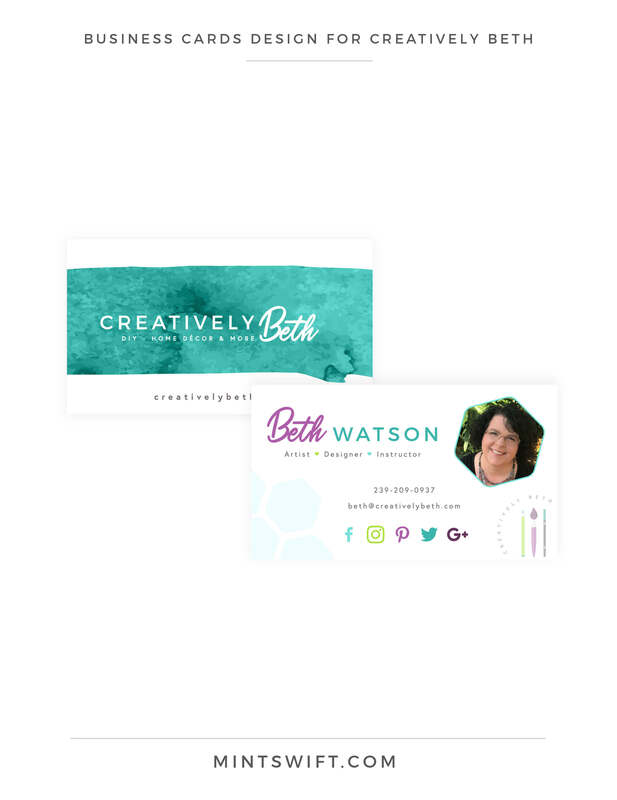 The front of business cards for Beth Watson, correspond to the email signature design with the teal watercolour swoosh, while logo and website URL. The back of the business cards features Beth’s photo, details, hexagon pattern and fourth submark logo. Now, let’s move a bit further and discuss a WordPress website that I developed and designed for Creatively Beth. Beth’s goal was to have a website that educates people to create though tutorials and help her connect with a creative community. She wanted a light and airy website with bright accents, that it’s easy to navigate, open and inviting. 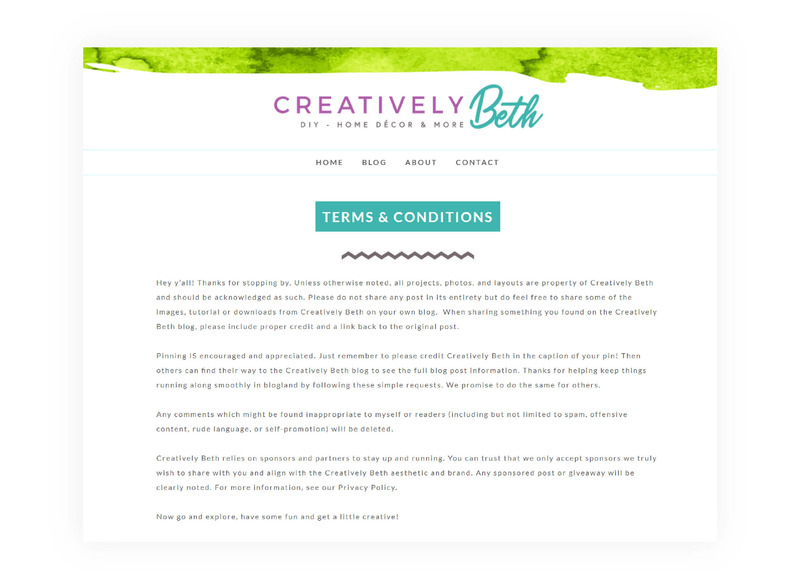 When you land on Creatively Beth website, you can instantly see a green watercolour swoosh in her header. 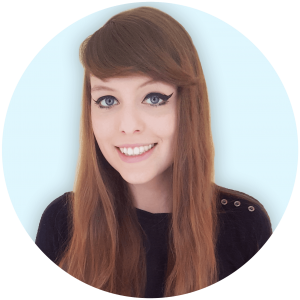 Beth wanted a sticky header on her website – meaning if you scroll down, you can still see the navigation menu and the logo at the top. The above the fold section of Beth’s website includes a profile picture with a welcome message. As I mentioned in the blog post graphic section, I incorporated the colour background boxes around some words to highlight them. Then, you can learn more about Beth. 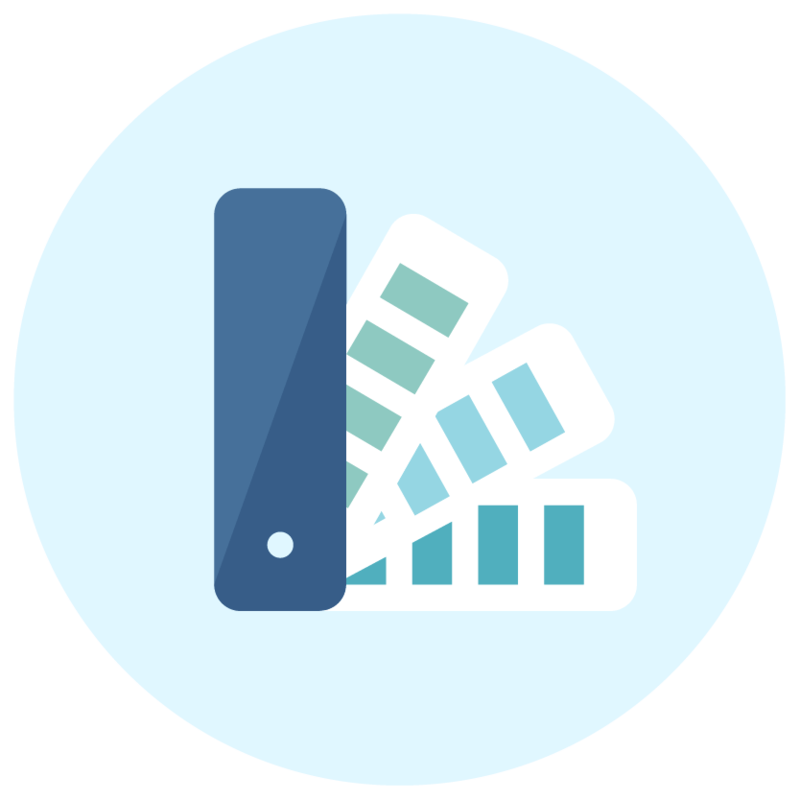 I created three sections with text, icons and separate them with chevron dividers. When you scroll down, you can see a custom image slider with popular projects from Beth’s and design teams blogs. Then, there are blog categories icons linking to the categories. 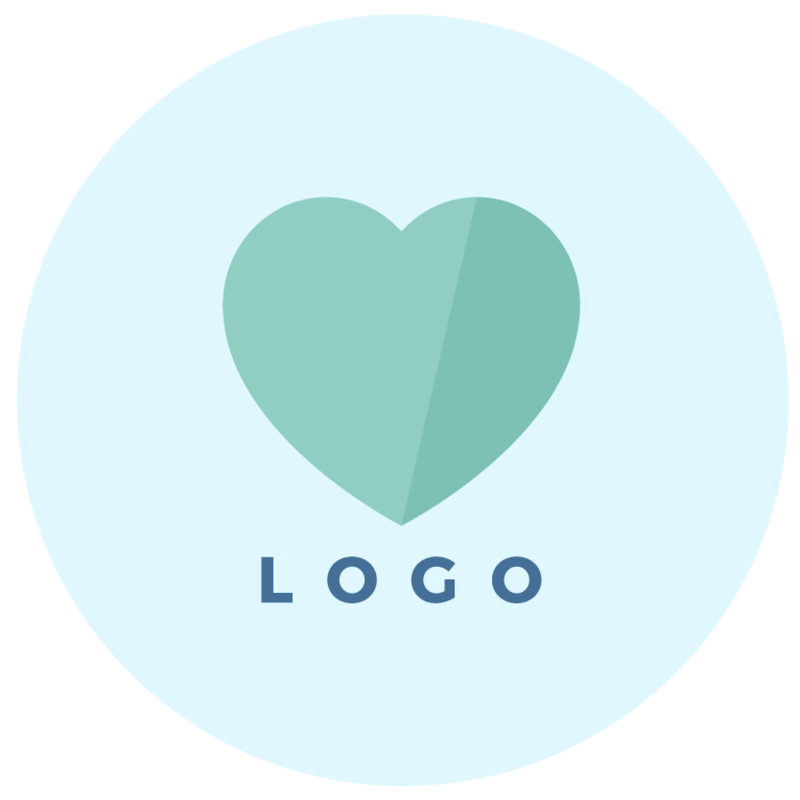 At the bottom, there’s a custom coded footer featuring the overlapping fourth submark logo, social icons and important pieces of information. 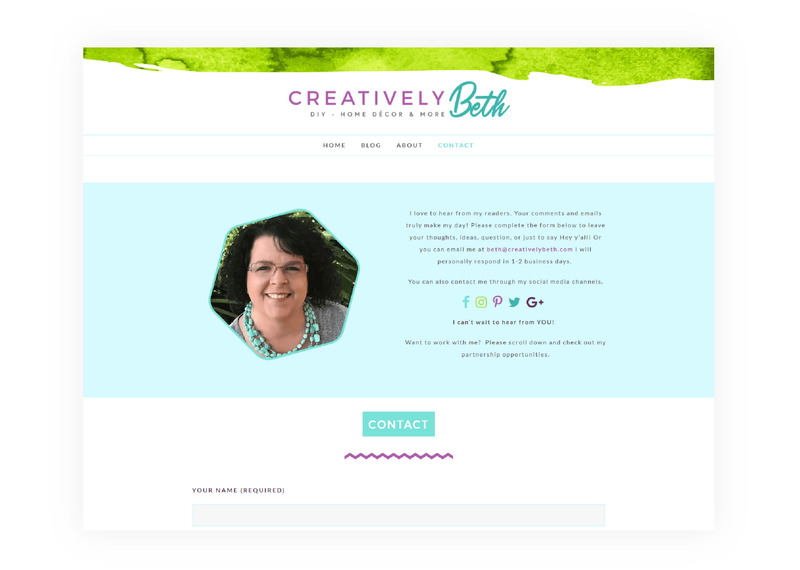 The blog page for Creatively Beth features a classic layout with sidebar on the right-hand side. On the left, you can see blog posts in two columns, showing blog post graphic (featured image), blog post title, post except and read more button. In the sidebar, there’s Beth’s profile photo (remember image holder from point 6? 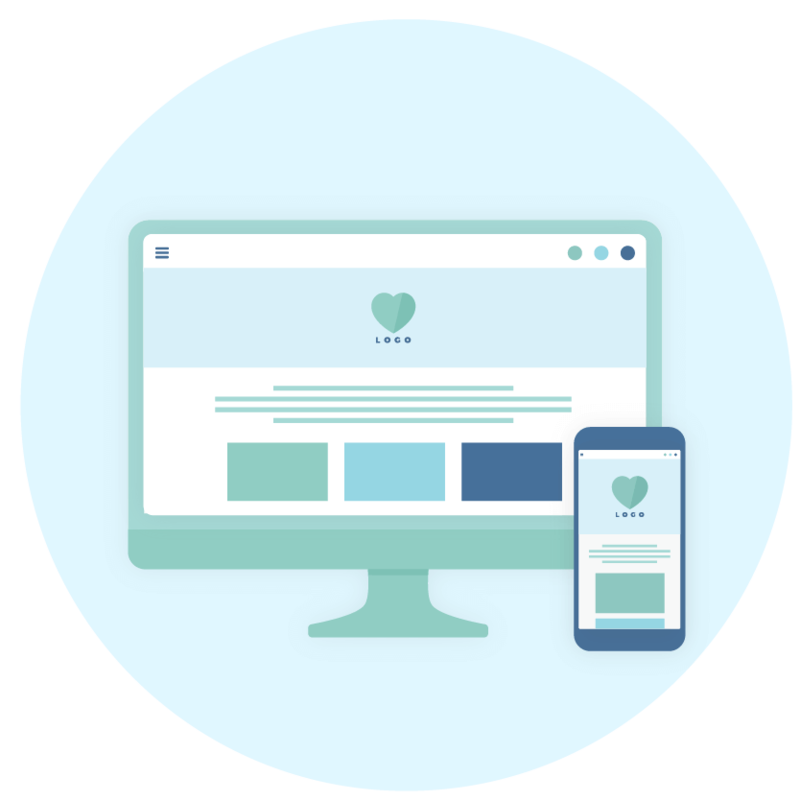 ), bio, social media icons, search form, email sign up form, blog categories, Instagram feed and embedded Pinterest profile. I designed a custom illustration to use around Beth’s photo on the About page, including some of the elements from submarks (pencil, Tombow brush marker, wide brush). 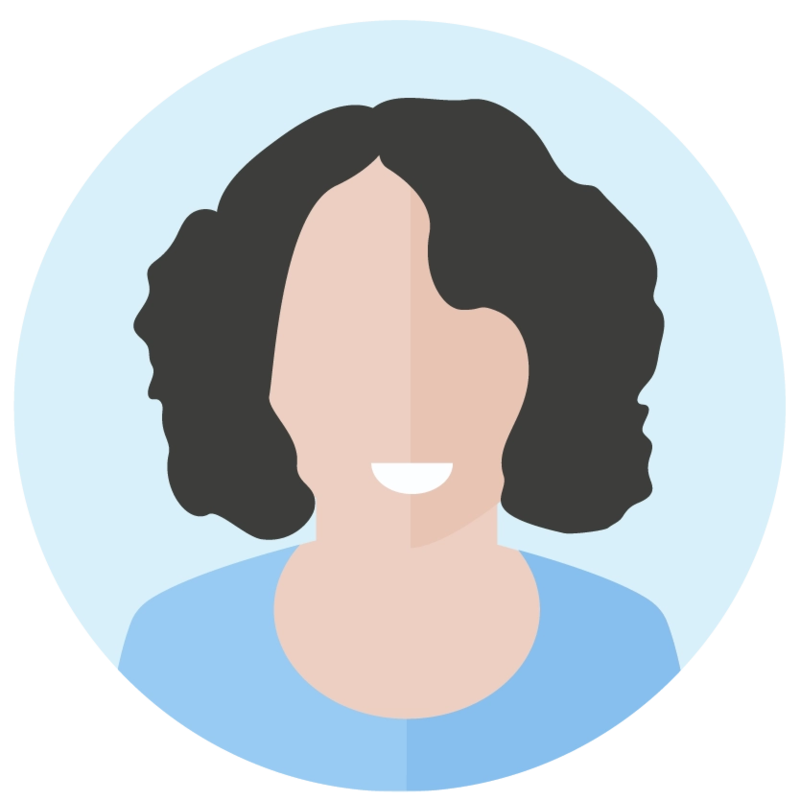 Below, you can learn more about Beth’s journey, read fun facts and see the design teams that she collaborates with. Beth really liked the full-width header from my website, so I created something similar on her Contact page. There’s also a contact form and information about working with her. Same as in the featured post on the homepage, I custom-coded the way the blog posts display in the blog category archive. 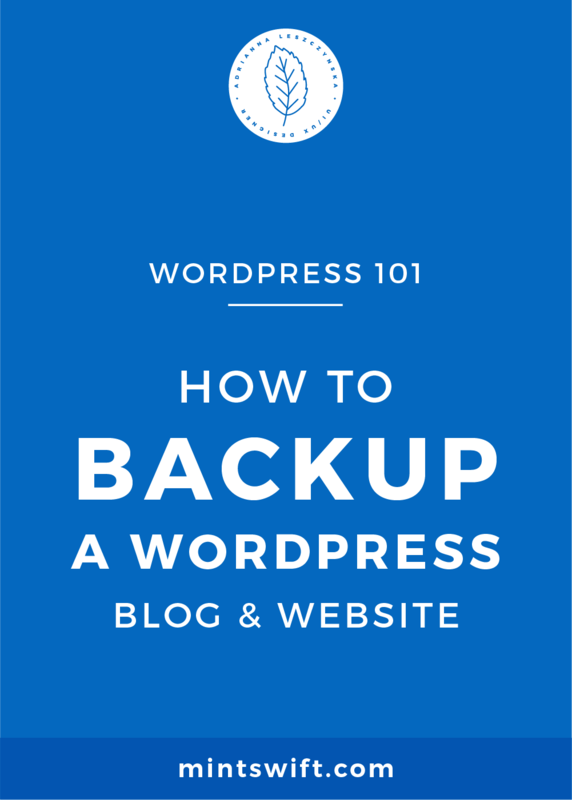 There’s a three-column layout, with featured images and white overlay with the blog post title. I added a pop of colours to the legal page, breaking it with chevron text dividers and colourful headers for each of the part of the page. 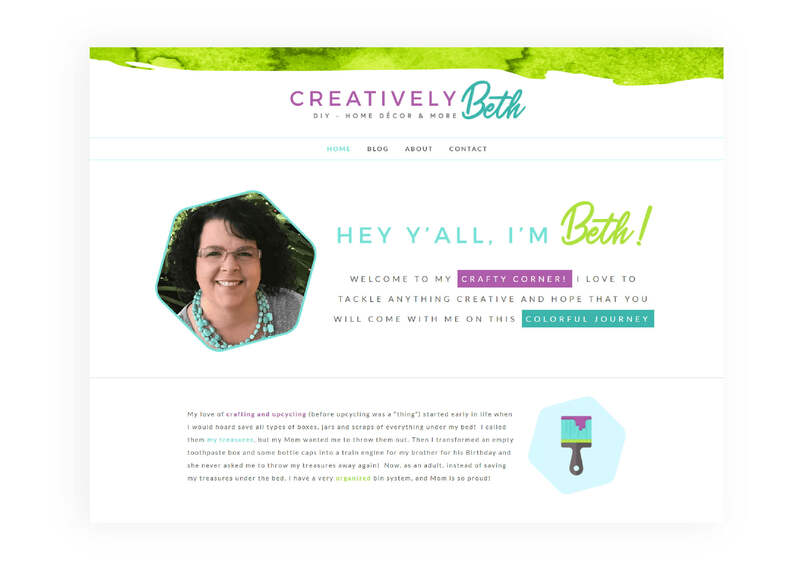 Want to see the brand board, all brand collaterals and website design for Creatively Beth on one image and see how cohesive her brand & website looks like when placed together? I’m grateful for the opportunity to help Beth transition her brand & business from Beth Watson Design Studio to Creatively Beth. I was blown away by Beth’s feedback during and after our time working together. I couldn’t have asked for better feedback – I love hearing that one of my main brand’s goals (to design brand & website that feels like you) came true! 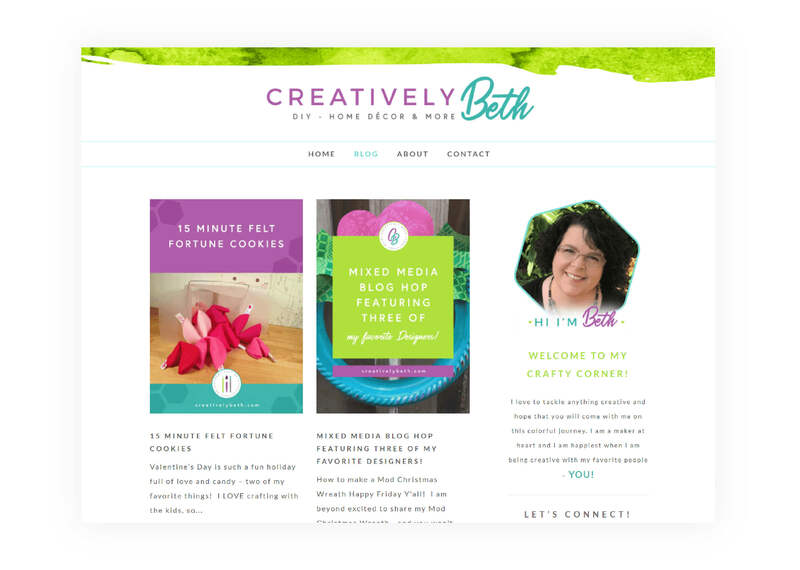 What do you think of the brand & website design for Creatively Beth?? 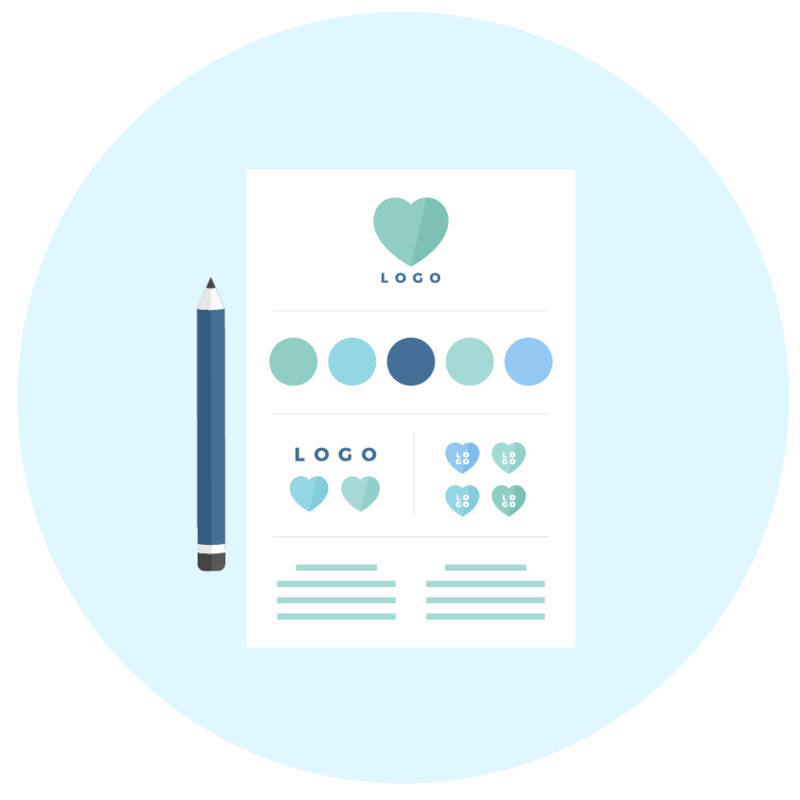 Which design, website page or collateral of the brand or website is your favourite?